Since I am still recovering from an annoying summer cold, there was even less bounce in my saggy bungee than usual when the alarm rang at 7:30 Thursday morning. I hit the snooze button repeatedly, then hit the dismiss snooze button and the next thing I knew it was 8:05 and I was rocketing out of bed as if the final shuttle launch was taking place in my modest abode. The shower felt so good, I dawdled and did not make it out the door until 8:45. Therefore, making it into my Tribeca office at nine from my Upper West Side starting point was looking less and less likely. Most mornings I do run late, but I usually manage to squeeze onto an express subway train traveling downtown and make the connection to a waiting local train at 14th Street. The local delivers me to my destination so I often arrive close to, if not miraculously on time. Many times I enter with colleagues so when I am actually late, arriving in the company of equally disgruntled and underpaid co-workers provides me with safety-in-being-late numbers. It’s as if we’re each other’s human shields. This morning was looking just like one where I would probably make my near-perfect train connections when suddenly I suffered whiplash for I experienced an extreme A-list level distraction. What prompted me to slam the brakes on my Jack Purcell badminton sneakers? A major sighting traveling down West End Avenue … Insert cliché drum roll here. The Google Street View car! Me (thinking): To hell with being late, I have to take a photograph! It's the Prius trying to act discreet with a camera apparatus on its roof. Due to my digital snapshot folly, I did miss the express train just as it was pulling out of the station. Instead of waiting on the steamy subway platform for the next express, I caught an arriving local train that had seats – always an indication that there would be plenty of train traffic ahead guaranteeing a slower commute. And it was a much more sluggish ride, but I didn’t care. I was elated that I got the shot and half considered sharing it with my seatmates, but decided that would be too transparently crackpot. 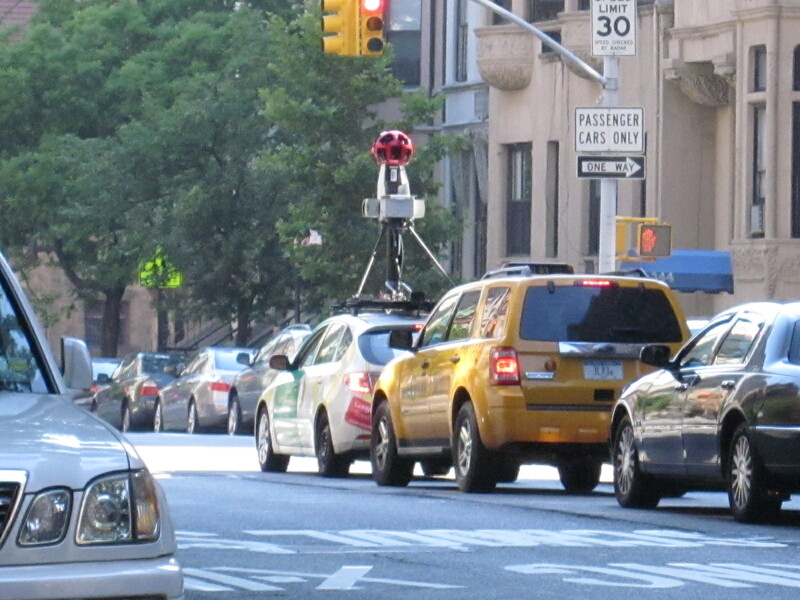 For more about the Google Street View car, Google Street View car expert or stalker (depending on what you thought of him in high school), Corey Kilgannon, wrote a wonderful New York Times City Room blog about it last month – complete with video. No one knows that car like him. This entry was posted in Humor and tagged google, google maps, google street view car. Bookmark the permalink. I rate seeing that elusive vehicle slightly under when I found myself face to face with Lena Horne about 25 years ago. It was a serious OMG moment. Very cool sighting – as for me I await my goal of seeing The Munsters dragster before I depart this world! Hm … are you being snarky about illness impairing me from chasing the Google Maps car?